Next comes a breakfast-in-bed suggestion from Chef boy - Magic Breakfast Steak Burrito. So simple is this Mexican invention that it is as easy as ABC even for husbands that are kitchen dyslexic. The only requirement to do this dish is the depth of one's love for his spouse. When the wife sinks her teeth into it, her smile will not only be on her face but also in her heart. 1. In a bowl, put in eggs, MAGGI MAGIC SARAP, fresh milk and cheddar cheese. Whisk until thoroughly combined. 2. Heat up a non-stick pan and melt butter. Pour in egg mixture and cook until eggs are set/done but not dry. Set aside. 3. Heat tortilla inside a toaster oven or in a pan. Fill each tortilla with 2-3 tbsp scrambled egg mixture, 2-3 slices crispy bacon and 1-2 tbsp of the cooked pork sausage. 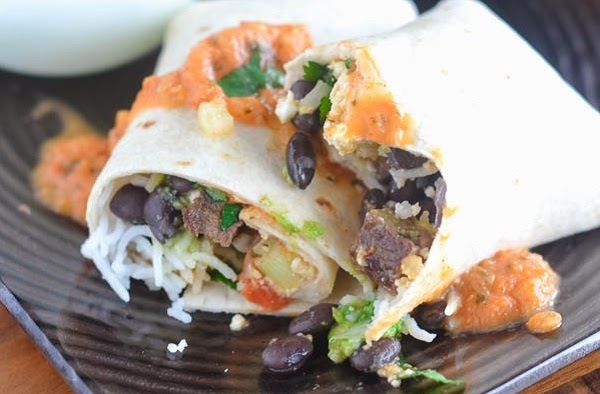 Wrap securely and serve with your favorite tomato salsa.